On Thursday 18 August, Dementia Friendly Swimming partners Tower Hamlets held a Tea Dance event at York Hall Leisure Centre. The event was organised after consultation with the Tower Hamlets and wider community, who showed a great appetite for a fun and engaging day. It provided a chance to raise awareness of the Dementia Friendly Swimming Project and to promote the Young@Heart project. It also helped to gain valuable insight on how to reach and engage the community in future events. 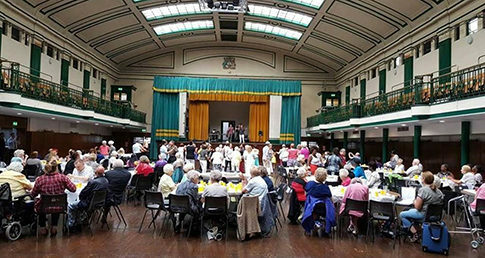 Around 175 people attended the Tea Dance event, including 50 who live with dementia. The majority of attendees were older people and disabled people. They had a chance to socialise with other like-minded individuals and have some fun watching the entertainment. One of the attendees, who is a regular Young@Heart participant, has a number of family members with musical talent. There were three generations of singers bringing smiles to the faces of their audience. Mayor John Briggs, whose mother lives with dementia, also joined in with the celebrations. Duane Newton, Swim England Dementia Friendly Swimming Project Lead, said: “It is fantastic to see our partners looking beyond the swimming pool, and using their contacts to bring together people living with dementia and other older people to enjoy socialising and meeting new people. “The Dementia Friendly Swimming Project is not just about swimming. It’s about improving the quality of life for people living with dementia and their carers. This Tea Dance event is the perfect example of how networking with other partners can do just that. Click here to find out more about the Dementia Friendly Swimming Project.